Is It Safe to Remove an Impacted Wisdom Tooth? While it doesn’t seem to make a lot of sense, there are some parts of the body we can just sort of… do without. Like the appendix, gallbladder, or wisdom teeth. When any of these start to act up, it’s painful — especially the last one. A wisdom tooth can easily become impacted, or stuck beneath the gums. And that doesn’t feel good. But is it safe to remove an impacted wisdom tooth? Yes, says your Houston oral surgeon. Not only is extraction perfectly fine for your health, it could actually save your life by preventing the spread of infection to the brain. Humans used to need wisdom teeth, back before we cooked our food. These third molars came in handy for chewing tough roots and meat — and now our diets have evolved, but our jaws still haven’t. There usually isn’t enough room for the wisdom teeth to grow in without issue. Without enough space to fully emerge, the third molars may come in sideways, or they may be totally trapped beneath the gums. They can push against the surrounding teeth, causing alignment issues. If one or more of your wisdom teeth are having problems, you will want to consider removal. Wisdom tooth removals are performed under local anesthesia, which numbs the jaw. If you need extra help relaxing, additional sedation can calm the nerves and help you doze throughout the procedure. For serious impactions, you may need to be put to sleep with general anesthesia to ensure that you do not feel any pain. To perform the removal, your oral surgeon will create a small opening in the gums. All of the bone and gum tissue covering the impacted tooth will be taken off, then the tooth will be removed. It may need to be taken out in pieces. 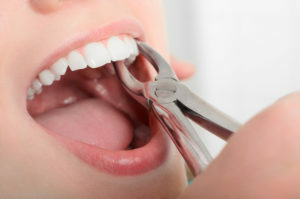 After the tooth has been removed, your oral surgeon will place a gauze on the site to slow bleeding and begin healing. Dissolvable stitches may also be used to close the area. Your oral surgeon’s team will send you home with precise aftercare instructions. Make sure you follow them closely to enjoy a speedy, healthy recovery. Your symptoms should subside after several days — but if they do not, get in touch with your oral surgeon right away. Dr. Steve L. Koo and Dr. Thomas M. Weil are Houston’s choice for oral surgery. Both maintain a superior level of care through a commitment to continuing education and expert solutions. If you would like to learn more about wisdom tooth extraction or any of our other services, please contact us at (713) 783-5560. Comments Off on Is It Safe to Remove an Impacted Wisdom Tooth?